Two days ago, I got a package in the mail from China. I was excited because I knew what was in it... I even called the post office and had them hold it so I wouldn't have to wait for afternoon delivery (my mail usually shows up around 2:30 p.m.). This particular box, though, was unique in that it was VERY inexpensive, and (almost) a complete kit. It was also unique in that this was my first experience with a group buy. How much? $21.90. 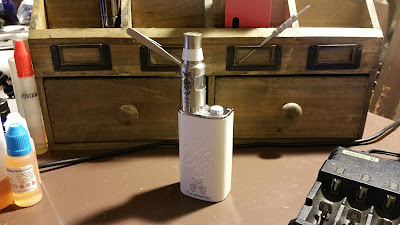 That was through the group buy, but the device and atomizer is still available for $24.51 plus shipping from Focalecig.com. It shipped with the box, the squonking atomizer, a coiling jig, two premade coils (which were not installed, had silica wicks, and came in at 2 ohms when installed in parallel), a magic blue screwdriver, some o-rings, and two bottles (but only one cap). All I needed was a battery and some e-liquid. There are other squonkers out there to be had. Lots of them. However, none of them can match this unit in price. In fact, you'd be hard-pressed to find an atomizer for less than you'll pay for this entire setup. Mine came to me in a padded manilla envelope. There was no presentation box. 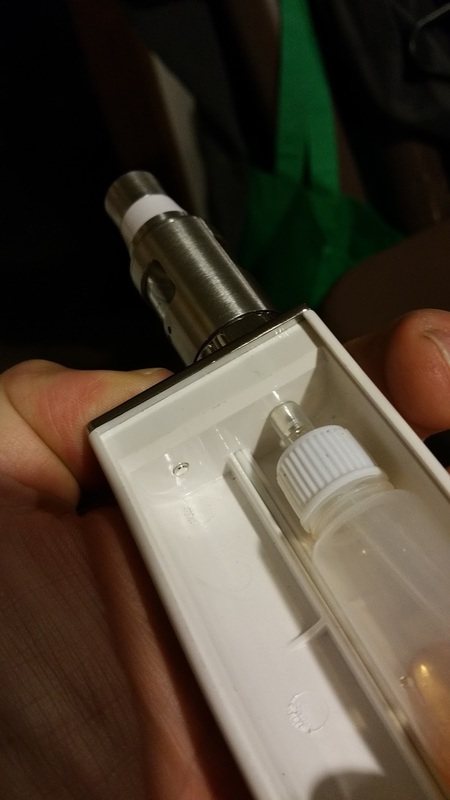 The atomizer was in a small, white box alongside the cellophane wrapped box. There was also an easy to overlook bag that contained a the remaining accessories. I suppose that is the price paid for early group buys. Upon opening the package, I found a white box - it also comes in black - that is curved on one side and flat on the other. On the curved side, there is a debossed Celtic knot-like design, and a screen-printed picture of crossed six-shooters, and the word "Terminator." On the flat side - which is also the door - there is another a debossed multi-diamond/basket weave pattern, and a 22 mm x 15 mm oval hole in the lower right hand corner. The door slides in and out set in slots, and is further secured by 2 exposed magnets in the door, and matching set hidden in the boxes body. Once the door is removed and you peer inside, you'll find a unique slot for a single 18650 battery on the left. 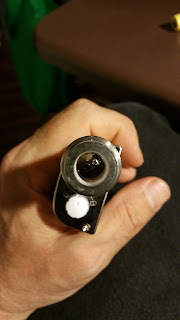 It is unique because there is an enclosed spring loaded pin for the negative contact and a hole where the positive contact should be. This is not a defect or an error. The positive contact IS the switch. When the button is depressed, a pin slides through the hole to make contact with the positive pole of the battery. From the negative contact, and tucked into a channel in the back of the box, is a length of white wire (I imagine it's black on the black model). The wire looks to be about 18 gauge, and where I might have liked to see heavier, this is adequate. 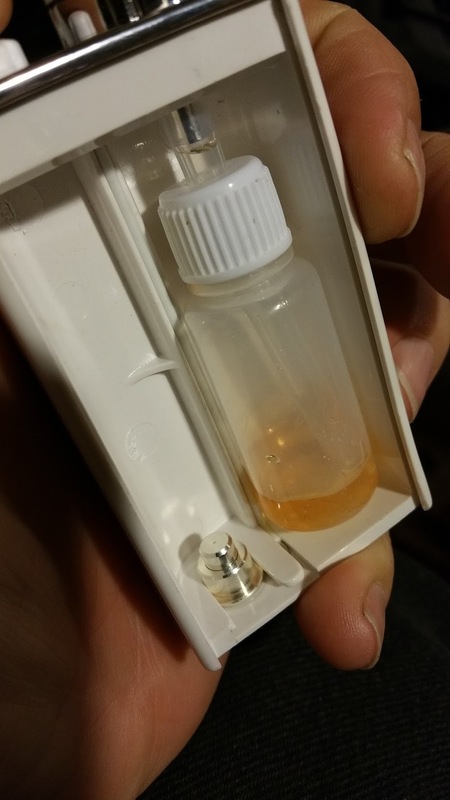 On the right hand side of the compartment is a 15 ml bottle (don't fill it to capacity - about 12 ml is fine). The bottle is capped and a tube, connected quite snugly to the positive pin, runs through the cap and to the bottom of the bottle. The bottom of the bottle reminds me that I should also mention that these devices are sometimes called bottom feeder mods. The door on my unit fit flush at the top, slid in and out easily, and was secure when in place, but the bottom edge hung over by about 1/8" on one side and was flush on the other side. A little dremel action, and it is now completely flush. I polished it with some Kraft paper, and it looks like new. 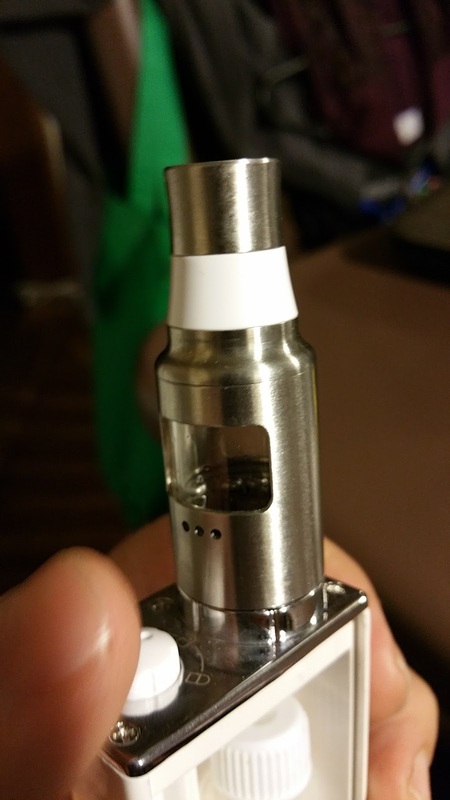 The bottom of the mod is the same plastic as the front, sides and back., but the top is covered in metal. There is a chromed plate with a button on one side and a raised 510 connection on the other. The raised connector is an odd 22.4 mm in diameter, and sports 6 grooves up the sades and to the center. The only thing stainless steel about the mod is the threading on the connector. The pins are supposed to be silver plated copper. The button is a small, notched white affair, with an indentation indicator, that turns about 30 degrees to the right or left to lock and fires when in the center of its swing. If you get confused, there are graphics on the top plate to guide you - two lock symbols to either side, and an unlock symbol in the middle. 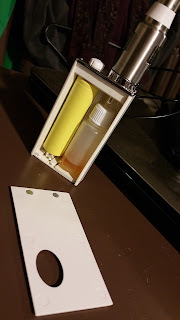 The box is small enough, and light enough at 47 mm wide x 27 mm deep x 85 mm to the top of the box / 89.4 mm to the top of the button / 90 mm to the top of the raised 510 connection and 4.5 ounces (with about 6 ml of juice in the bottle and an 18650 battery installed), that the button can be pushed with your thumb or forefinger. I prefer thumb. Long story short, it's a cheap, but functional plastic box with adequate buttons, wiring, and materials. 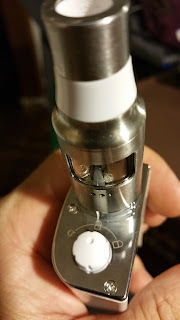 The atomizer, on the other hand, is quite nice - but not without flaws. The deck is a three post, four hole design allowing for very easy dual coil builds. The juice well is about 4.5 mm deep with "ears" that can block off air flow when the cap is rotated. 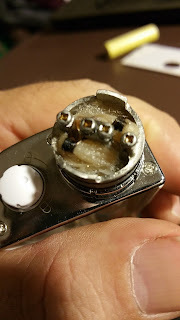 As it is, it's not set up for single coil builds, though. The cap, which comes apart into five sections, measures 58 mm from tip to base, and 62.25 mm to the base of the 510. 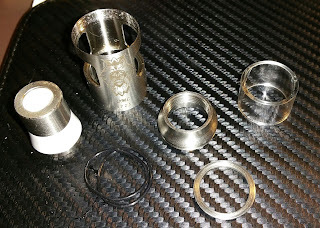 The five sections include a proprietary, screw-in steel over plastic drip tip, a small reducer, a steel o-ring retainer, a glass tube with a rubber o-ring on top and bottom, and the outer shell. The outer shell features large glass windows on either side, three 1.5 mm airflow holes which can be blocked with the deck's "ears", and a laser engraving of an owl cradling a skull in its wings. Funnily enough the word below is not owl, but OML. Someone in China ran out of Ws and forgot to flip the M.
The flavor is OK, but not intense. You're not going to get intense flavor from a chamber this large, through a drip tip this big. You can, however, get some really nice clouds and acceptable flavor. Some people have voiced a concern about the plastic in the box and the mod. It's been said that after a few days, there's a strong plastic taste and smell. I have not experienced this. It's no real problem as most any 10-15 ml plastic bottle will fit. I keep ending up my reviews with the question "would I buy this again?" That's the wrong question to ask as I've decided I can only have one of everything (LOL). With that in mind, the correct question would be "Am I happy I bought this?" Finish 7/10 - The box is plastic and there's no way around that. Further, not all of the pieces fit quite right. Form 9/10 - Light and comfortable. Function 10/10 - There's virtually no learning curve to use this new style of device... it's very simple and vapes quite nicely. Slap in a battery, add some proper coils and wicks, fill the bottle and tuck it into the box. Give the bottle a squeeze and vape. BONUS POINT for being so very affordable! Great review for Focalecig Smokeless Owl Bottom Feeder! Great detailed review! I just bought this and trying to figure out how to put it together.